In 1970, Nissin formed the subsidiary Nissin Foods (USA) Co. Inc, to sell instant noodles in the United States. 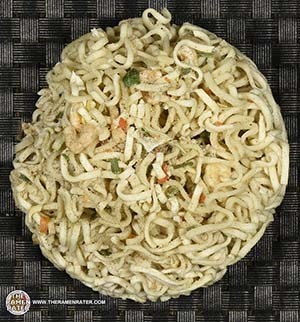 Nissin recognized that the bowls traditionally used to package instant noodles in Asia were not common in the U.S, so they used the paper cup designed by Ron R. Matteson. In 1971, they introduced instant ramen packaged in a foam cup. In 1978, Nissin Foods offers new varieties of Top Ramen and Cup O’ Noodles. 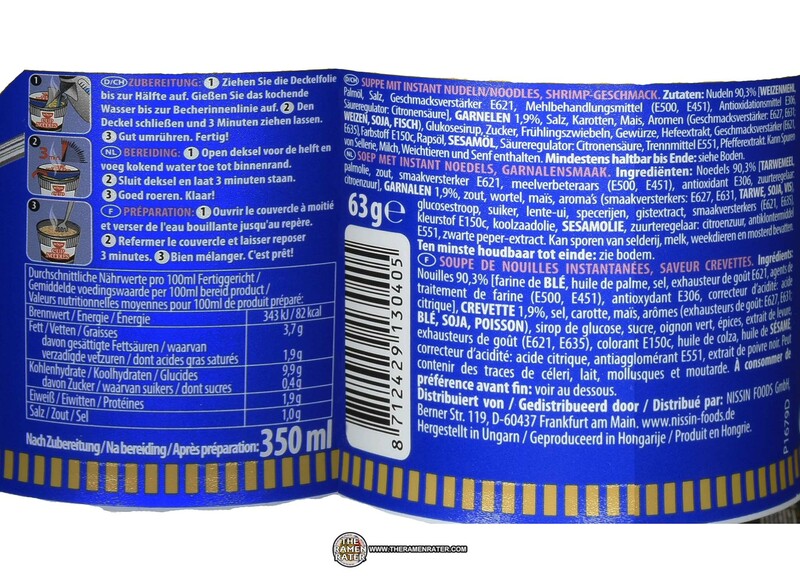 The product was known as Cup O’ Noodles in the United States until 1993. 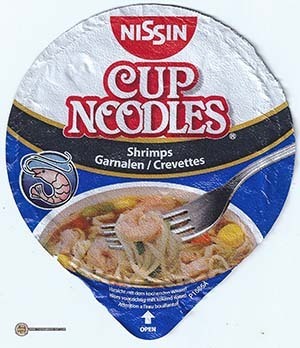 In 1998, Cup Noodles Hot Sauce Varieties introduced (Beef, Chicken, Pork and Shrimp). Today, instant noodles in Japan are often sold in foam bowls, sometimes with plastic utensils. Foam bowls are inexpensive, disposable, light, and easy to hold, since they insulate heat well. I am very curious to try this one. I like shrimps – let’s check it out! Detail of the side panels (click to enlarge). Contains shrimp. To prepare, add boiling water to fill line and cover for 3 minutes. Finally, stir and enjoy! Some loose bit from inside the cup. Finished (click to enlarge). Added 31-44ct shrimp and spring onion. 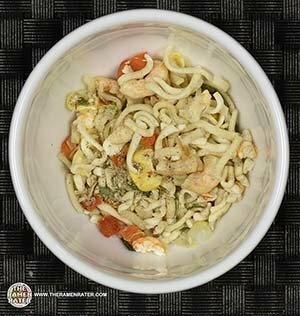 The noodles cooked well – a hint of al dente. 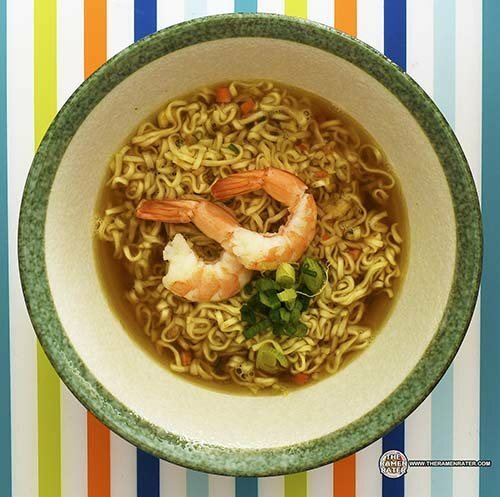 The broth is salty and has a kind of standard Cup Noodles shrimp taste. Included garnish worked well. A very standard Cup Noodles variety. 3.0 out of 5.0 stars. 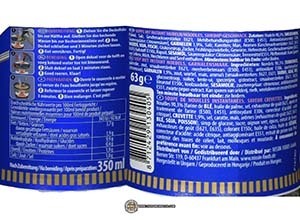 EAN bar code 8712429130405. 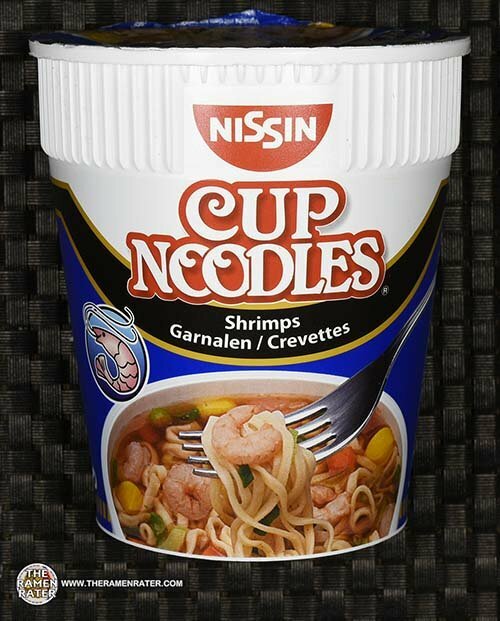 This entry was posted in * Meet The Manufacturer, * Stars 2.1 - 3.0, Germany, Nissin, Seafood and tagged 2485, 712429130405, 8712429130405, cup noodles, germany, meet the manufacturer, nissin, shrimps on July 1, 2017 by Hans "The Ramen Rater" Lienesch.